Between our successful businesses, generous community members and gorgeous Niagara-on-the-Lake real estate, our city is truly blessed in many ways. Wishing to spread these blessings around, the Niagara Community Foundation recently established the Niagara-on-the-Lake Fund, which will pool together financial resources to support long-term charitable goals and build legacies. This fund only began a few weeks ago, but it is already off to a rousing start. Initial donations by founding members totaled up to $450,000. These contributions were made by community leaders like Lord Mayor Pat Darte, Vintage Hotels CEO Bob Jackson and the family of Joe Pillitteri. Donations to the Niagara-on-the-Lake Fund are invested according to the donor’s preferences, and the resulting interest and growth will be put back into community programs for “arts, heritage, environment, social services, health, education, recreation and community development,” according to myNOTL.com. I am personally extremely proud of the Foundation’s efforts so far, and cannot wait to see what great things come out of the Fund’s resources. The Niagara Community Foundation kicked off raising capital for the Niagara-on-the-Lake Fund at an event held just a few weeks back on November 10, 2016. Taking place at the Queen’s Landing restaurant, Lord Mayor Pat Darte formally announced the fund along with his family’s own contributions. A committee for the fund has also been established. It includes Wendy Cheropita as chair along with a list of members that includes Ken Bridgman, Ann-Louise Branscombe, Mario Ferrara, Brianne Hawley, Nancy Brazeau, Shawn Spiewak and Mayor Darte himself. All of the contributions made go into an endowment fund. This endowment fund is managed through strategic investments that grow capital wealth and enable withdrawals that can be used towards charitable causes. Payouts have yet to be made until the fund can provide stronger returns, but past Niagara Community Foundation grants have gone to community organizations that include the Niagara Historical Society, the Niagara Regional Native Centre, the Niagara-on-the-Lake Public Library, the Niagara Pumphouse Visual Arts Centre, Music Niagara and many others. The fund will provide updates to contributors and the press every fall. Families and businesses can contribute as little as $50 a month for 150 months to establish a legacy program that will benefit present and future generations. Foundation members’ current goal is to double the initial $450,000 endowment within six months. 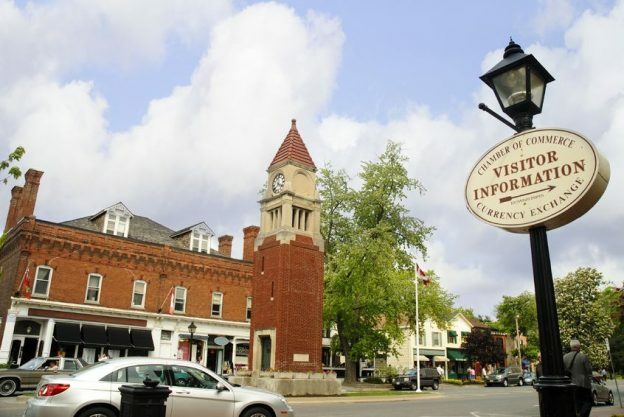 Passionate business owners and community programs like these are just some of the reasons Niagara-on-the-Lake residents feel so fond of their town. Come become a part of our family, and watch as the Niagara-on-the-Lake Fund helps strengthen our community and its most critical programs through the collective compassion of each contributor. You can visit our buyer’s page to see homes for sale in Niagara-on-the-Lake and start your search for a place among our friends and neighbours today. This entry was posted in Blog, NOTL Realty, Uncategorized on December 14, 2016 by Kevin Stokes.